Hi folks! Busy weekend, got a lot done! A quick post to show you the dresser and night stand combo that I finished today. I really loved the first one I did (you can see it here) and had hoped to keep it for myself. But I wanted to see how it would do on Craigslist. It sold very quickly, quicker than I had expected… so I knew I would have to do more. Many more, so in the end I could keep one for myself! Ha! I find these very fun to do, albeit a little expensive because of all the hardware. I keep my eyes open for hardware postings on Craigslist and even look for old furniture that might not be worth fixing or decorating, just for the hardware. I like the look of a well worn suitcase, so older hardware works well for that. The dresser is only four drawers (as opposed to five before) but there is the addition of the night stand. I think this would be an awesome addition to a guest room, making the presence of a traveler’s actual suitcase fit right in! The house has been overrun with projects as here in Missouri, the temperatures are a bit too cold (even in the garage) to paint. And definitely a bit uncomfortable to spend much time in, so I have moved what I can into the house. The entryway has a dresser cabinet being painted, the drawers are drying on the kitchen island. Another small cabinet (being done in black/gray ombré) has overtaken the dining table. The ottoman in front of the television is the workspace for an awesome over-sized scrabble game board (about to become a gaming table), leaving just about no space for us to live! Well, thanks for stopping by! And Happy Crafting Y’All! These are gorgeous! Great work! Thank you! It is really a labor of love… making beautiful things. I just wish I had a bigger house to be able to keep all the things I make! This is awesome! 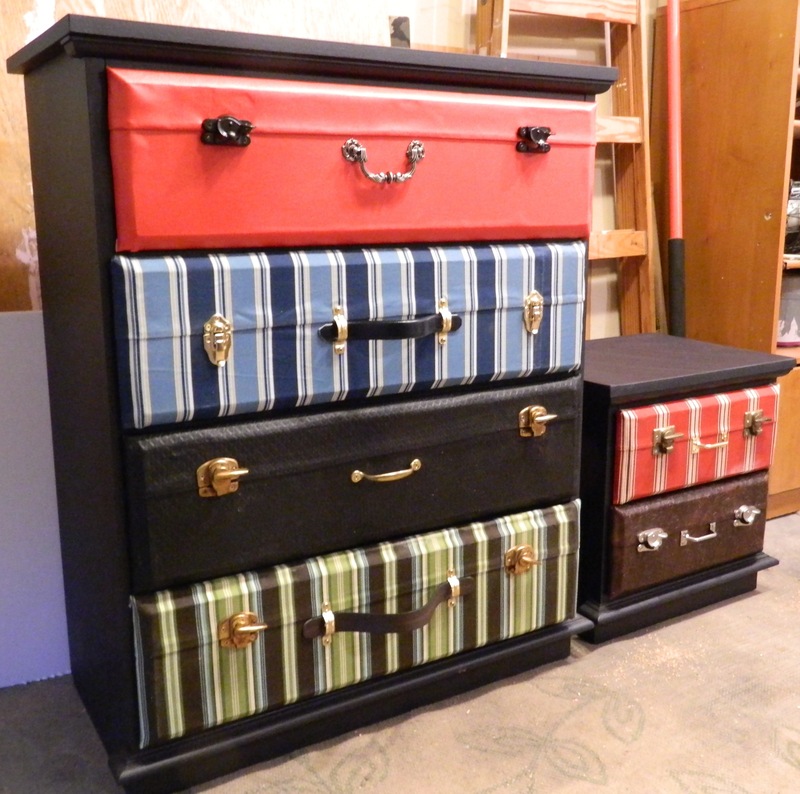 I want a dresser like this for my son’s room that we’re doing in a Harry Potter theme. I think this would be perfect. Do you sell items like this?